Latin Americans clearly are not holding their breath waiting for the United States to translate shock into action in the wake of the killing of 20 first-graders and six teachers at a school in Newtown, Connecticut, two months ago. In December and January, media such as El Espectador (Uruguay), La República (Peru), and El Universal (Mexico) reported that the easy access to firearms and lax gun controls were factors in the massacre. While making note of President Obama’s pledge to reduce gun violence, including proposals he is sending to the U.S. Congress, few if any commentators in the region expressed confidence that the legislature, many of whose members are beholden to the National Rifle Association, will do anything. As the largest source of illegal weapons to Mexico, Central America and perhaps the rest of Latin America, the United States’ inability to control its own violence has a direct bearing on the region. Rather than clamor for action as they would in the past, Latin American opinion-makers appear resigned to U.S. inaction – and puzzled at how a single lobby can prevail on an issue as sensitive as the safety of schoolchildren. The dismay will only be fueled by reports by The Christian Science Monitor and other prestigious U.S. media this week that the “assault weapons ban” under consideration in Washington would exempt more than 2,200 specific firearms, including a semi-automatic rifle that is nearly identical to one of the guns used in the bloodiest shootout in FBI history. A retired FBI agent called the proposal “a joke,” and so will many Latin Americans. 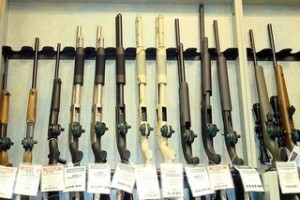 As recently as 2010, Latin American governments called on Washington to ratify the Inter-American Convention against the Illicit Manufacturing of and Trafficking in Firearms, Ammunition, Explosives, and Other Related Materials (called CIFTA) – signed by the Clinton Administration in 1997 – but it is clearly a bridge too far now. Might the U.S. Release Simon Trinidad?